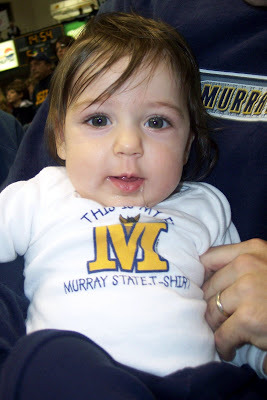 Cate attended her first Murray State basketball game last night. 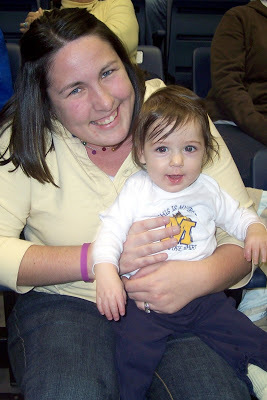 And she enjoyed being around all those cheerful people and hearing the band. And, in case you’re wondering, the whole crowd probably enjoyed it. Murray State won by a point after a Rider player fouled a MSU player with .2 seconds left. MSU’s Kevin Thomas hit the first free throw to give the Racers the lead. He missed the second intentionally so Rider wouldn’t have time to set up a shot. The rest of the weekend also was good … Friday night Greg and I rented “License to Wed.” Funny. But glad we just rented it. Then Saturday morning I went to some yard sales and found a couple of bargains before we went to Paducah to Christmas shop. Then this morning, Greg let me sleep in! I didn’t wake up until 9:20! I was a bit rushed for church, but it was worth it. Since church and lunch, we’ve just been hanging out at home. We watched the Titans game (which left much to be desired) and then the two-hour “CSI” and “Without a Trace” collaboration from Thursday night. Ahahahahaha, that little Murray shirt is so cute! Someone bought my 2-month-old daughter a teeny little UK Wildcats cheerleading outfit. Is so adorable, omg. In other news: when did Cate get so big?! ?